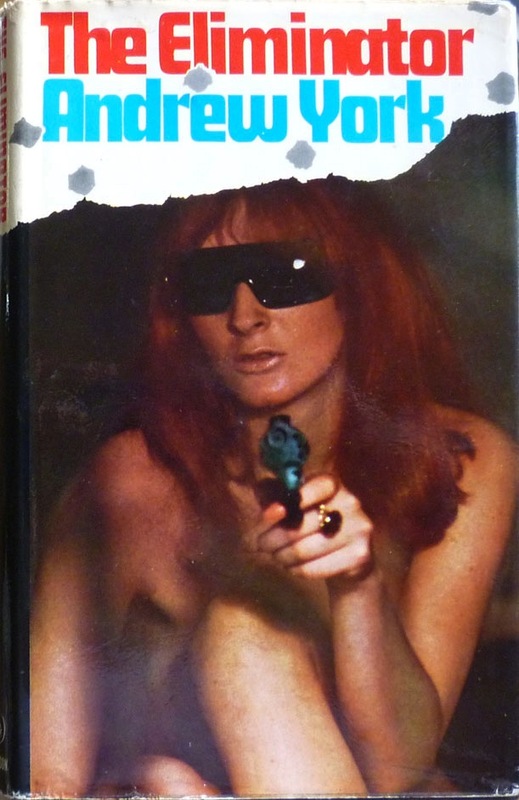 On to the second of two posts on Guernsey-based author Christopher Nicole's pseudonymous series of espionage novels starring a state-sanctioned assassin, written under the nom de plume "Andrew York" (one of many Nicole aliases). And having posted a brief introduction to Nicole and a glorious gallery of first edition fillies, today I turn my attention to the first instalment in the nine-book series: The Eliminator. 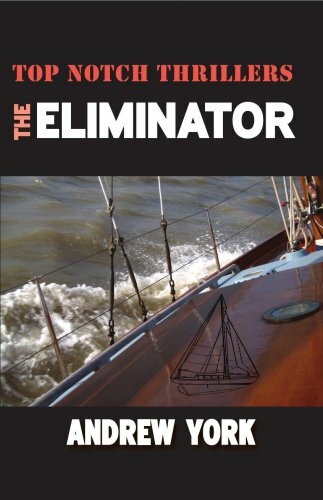 Originally published in hardback in the UK by Hutchinson in 1966, The Eliminator introduces Jonas Wilde, Great Britain's state executioner. When we first meet Wilde he's on assignment in Barbados, in disguise as tourist Charles Vane, his target a wealthy businessman. Wilde is rarely given reasons for the killings he carries out; he merely takes it on trust that the individuals he assassinates (more than twenty over the course of his career) are deserving of elimination. So when, having completed his Barbados assignation, Wilde is directed by his boss, Antony Canning, to fix his sights on a scientist named Stalitz, Wilde's only reservation is that the killing has to take place in the UK. 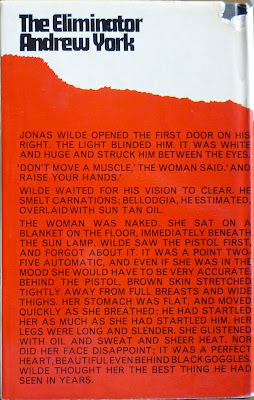 The Eliminator is literally a book of two halves: the first half, titled "The Assassin", details Wilde's life, his associates, how The Route works, and two of his missions; the second half, titled "The Avenger", then yanks the rug out from under Wilde's feet in spectacular fashion, sending him on a hunt for the man who has betrayed both him and his country. Both parts have their merits – the sequence in part one where Wilde gains the trust of Rhoda Gooderich, the housekeeper at the country estate, is especially delicious – but it's in part two that the tension really escalates, climaxing with a neat, unexpected twist. But the abiding impression one is left with is how elegantly written The Eliminator is – which is why it's so surprising that the Jonas Wilde series has slipped into semi-obscurity. It's something that John at Pretty Sinister Books remarked upon in his recent review, and hopefully something that will be addressed now that Mike Ripley's Top Notch Thrillers imprint is reviving the series. Certainly The Eliminator is a cut above the more run-of-the-mill James Bond-inspired sixties spy boom dross – I couldn't help thinking whilst reading it that, like the Bond novels, it would have made an excellent film – and I'll definitely be returning to Wilde's world before too long. THE ELIMINATOR was made into a film. It's called Danger Route and I talked about it on my blog as well. The movie was on TV over here two weeks ago but it ran in the afteronoon while I was at work and I couldn't be irresponsible enough to take off just to watch it. Plus, I don't own any of those DVD-R gizmos since I don't pay for cable TV and I couldn't record it so I missed it. Nuts! But it's supposedly available via Netflix for those in the US who subscribe to the streaming plan. There are two clips I found on YouTube that I put up on my blog here for those interested. Ooh, I completely missed that on your blog. Thanks, John. And watching those clips, Danger Route actually looks a little familiar. I wonder if I pictured The Eliminator as a movie because I had, at some point (presumably on telly), already SEEN it as a movie...? "Danger Route" is actually quite a good, low-budget film with a solid cast of British acting stalwarts, including the excellent Richard Johnson as Wilde, plus Sam Wanamaker as CIA chief 'Lucinda'. It is available (possibly legally) on DVD in the UK. I know because I got a copy for Chris Nicole as he told me he had 'long ago worn out his VHS tape'. The next Jonas Wilde revivals will be "The Predator" and "The Deviator" and will be published in April by Ostara as Top Notch Thrillers. And thanks for the info about the next few Jonas Wilde reissues!